At long last, we present a brand-new edition of The Odyssey ScoopCast, our home-baked podcast about everything Adventures in Odyssey. It also serves as the long-awaited final installment of our interview series with Katie Leigh, voice of Connie Kendall on AIO. 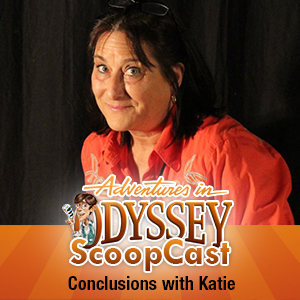 The Odyssey ScoopCast concludes its interview with actress Katie Leigh, voice of Connie Kendall for Adventures in Odyssey. Katie recollects the recording of “Life Expectancy” and shares the ease of playing Connie for over two decades and bringing herself to the part.